Die Filtertrockner mit austauschbaren Blockeinsätze (HTG Serie) werden als Trockner in Flüssigkeits- und Saugleitungen von Kühl-, Tiefkühl- und Klimaanlagen eingesetzt. Das Filtergehäuse erlaubt die Wahl unterschiedlicher Blockeinsätze. Great desiccation ability is applicable under wide range of temperature showing high pressure educability and excellent anti-shock performance. The even size of desiccant beads removes impurities effectively and keep low pressure drop. Composition of solid element: 3A Desiccant, active alumina for acid absorption. 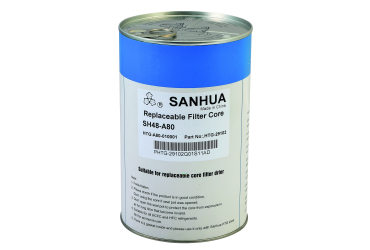 Great water absorption performance, effectively filter out impurities 100% 3A desiccant can work with POE oil with strong moisture absorption capability. Applicable refrigerant: R134a, R 404a and R 407C etc. 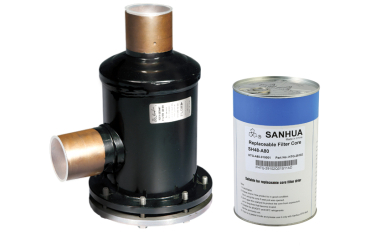 Protecting compressor, Effectively absorb acid and water; filter out impurities; extend the service life of compressor.